On display in New York's MoMA, Riedel's Burgundy Sommeliers wine glass is part of its the top-of-the-line Sommeliers series of stemware. 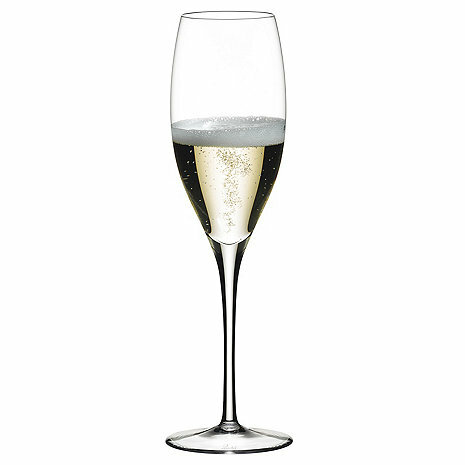 Riedel Sommeliers Champagne Flutes bring out the fine aromas and effervescence of fine Champagne and sparkling wine. The Champagne flute, filled with four ounces of Champagne, concentrates the unique, yeasty bouquet, while emphasizing their creamy texture on the palate. The bubbles are not allowed to dominate, but are part of the overall pleasure. Size: 9-5/8"H x 2-1/8" Dia., 11-5/8 oz. My fiance and I wre looking for toasting flutes for our upcoming wedding. Finding nothing we liked that was wedding specific and having already experienced the magic of the Sommeliers Zinfandel glass, we decided to go with these flutes. The sommeliers flutes are wonderful, and the flavor of even cheap champagne, (yes, we bought cheap to test the flutes against what we already had), is markedly improved. I don't understand it, but I can't deny the effectivness of these flutes. Based on an article written by Peter Liem, a well known American expert on champagne, on tasting and judging Champagne I added this Sommelier Flute to my glass collection. As a wine writer and judge this enhanced my ability to detect aromas that are lost in smaller Flutes. Worth the purchase. Unfortunately I had to return the glass as the description did not say it was a Vintage Sommeliers flute. I need to replace a Sommeliers flute which is much narrower. I did like the look of the glass but was not about to start a new set. Returning the glass was very easy. Great customer service!